Let’s find the volume of shapes. Four students each calculated the volume of a sphere with a radius of 9 centimeters and they got four different answers. Han thinks it is 108 cubic centimeters. Jada got $108\pi$ cubic centimeters. Tyler calculated 972 cubic centimeters. Mai says it is $972\pi$ cubic centimeters. Do you agree with any of them? Explain your reasoning. $$288\pi =\frac43 r^3 \pi.$$ What is the value of $r$ for this sphere? Explain how you know. 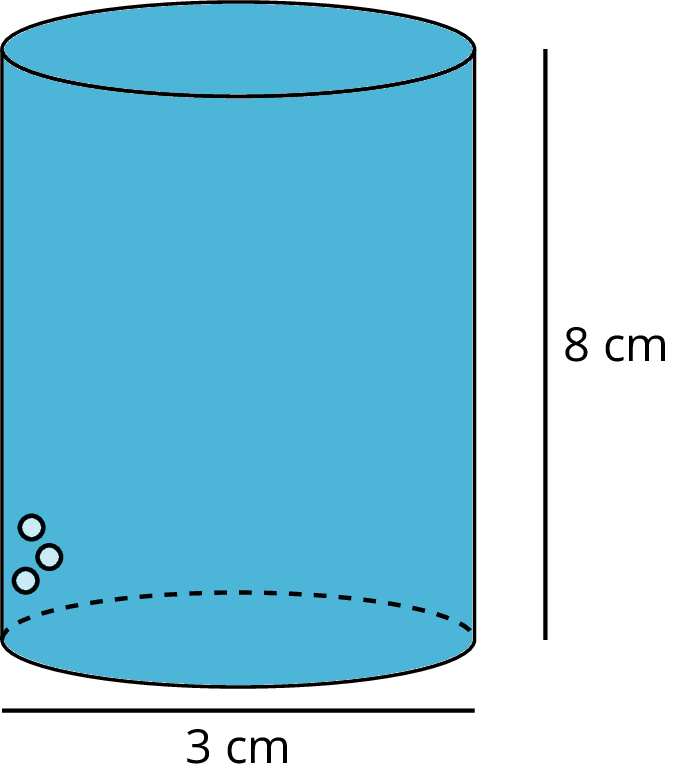 A cylinder with diameter 3 centimeters and height 8 centimeters is filled with water. Decide which figures described here, if any, could hold all of the water from the cylinder. Explain your reasoning. Cone with a height of 8 centimeters and a radius of 3 centimeters. Cylinder with a diameter of 6 centimeters and height of 2 centimeters. Rectangular prism with a length of 3 centimeters, width of 4 centimeters, and height of 8 centimeters. Sphere with a radius of 2 centimeters. A thirsty crow wants to raise the level of water in a cylindrical container so that it can reach the water with its beak. The container has diameter of 2 inches and a height of 9 inches. The water level is currently at 6 inches. The crow can reach the water if it is 1 inch from the top of the container. In order to raise the water level, the crow puts spherical pebbles in the container. If the pebbles are approximately $\frac12$ inch in diameter, what is the fewest number of pebbles the crow needs to drop into the container in order to reach the water? That means that $r^3 = 27$, so the radius $r$ has to be 3 units in order for both sides of the equation to have the same value. Many common objects, from water bottles to buildings to balloons, are similar in shape to rectangular prisms, cylinders, cones, and spheres—or even combinations of these shapes! Using the volume formulas for these shapes allows us to compare the volume of different types of objects, sometimes with surprising results. For example, a cube-shaped box with side length 3 centimeters holds less than a sphere with radius 2 centimeters because the volume of the cube is 27 cubic centimeters ($3^3 = 27$), and the volume of the sphere is around 33.51 cubic centimeters ($\frac43\pi \boldcdot 2^3 \approx 33.51$).